Speaker of the House John Boehner announced that he would be resigning by the end of October. The move came as a shock to many, especially in the GOP. 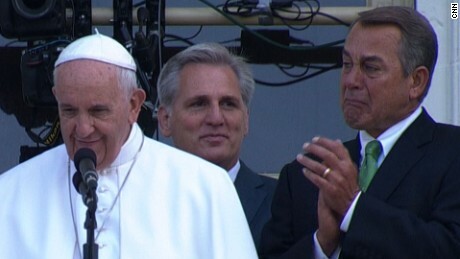 Some believe that perhaps the Pope's visit to Congress had an effect on him. He visibly cried inside of the House chambers as well as on the Speaker's balcony. However, political pundits believe he resigned after pressure from a more conservative faction in the GOP which wanted him to push for legislation that defunded Planned Parenthood or shut down the government if the defunding did not take place. Boehner has been in office since 2011 and have received a lot of criticism for now being able to stop Obama from pushing his agenda on the American people. He has tried to stifle Obama's plans but has failed to do so. Even after Republicans took both the House and Senate, Boehner has not been able to lead republicans in stopping Obama's agendas and making a Republican accomplishment stand out.